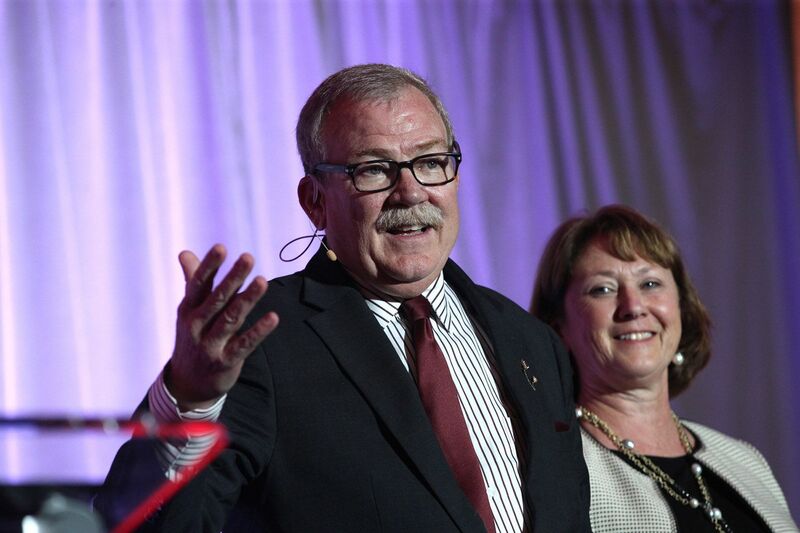 The most ambitious fundraising effort in Bates history aims to “secure what is best and most distinctive about Bates and to shape new strategies for a new age,” President Clayton Spencer told a record-setting crowd of Bates supporters who gathered in Boston on Tuesday evening for the first of two launch events for the $300 million Bates Campaign. Judging from gift totals announced at the event, the campaign is already a compelling one for Bates donors. During its two-year “quiet phase,” The Bates Campaign has attracted $168.5 million in gifts and pledges, more than half its goal, Spencer said. 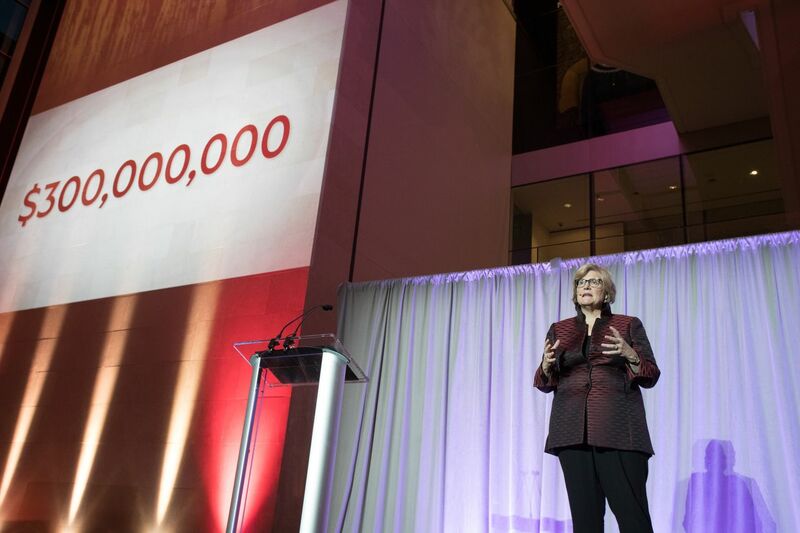 During its five-year run, The Bates Campaign has several broad goals: to strengthen the college’s endowment by $160 million through professorships and endowed funds for financial aid and academic innovations; improve facilities, including new and modernized STEM facilities; increase funding for programs focused on student success, including Purposeful Work; and sustain a strong Bates Fund. 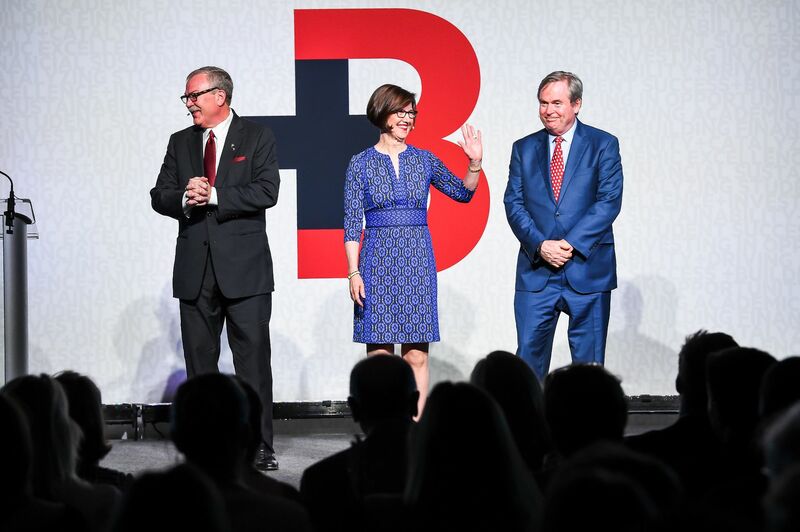 Punctuated by hearty rounds of applause, the evening had its loudest ovation following Spencer’s announcement of a stunning $50 million gift from Michael Bonney ’80 and Alison Grott Bonney ’80. The first of four campaign launch events, the Boston event was followed by a New York City kickoff on Thursday at the Intrepid Sea, Air & Space Museum that drew a crowd of some 400 supporters. Coming up are events on the Bates campus (today, May 19) and in San Francisco (June 15). Hosted by broadcast journalist Bryant Gumbel ’70, who also hosted Thursday’s launch in New York, Tuesday’s lively, multimedia-filled event put Bates students, faculty, and campaign leaders front and center, to the delight of some 700 alumni, parents, and friends — the largest off-campus gathering in Bates history — who filled the Museum of Fine Arts to near capacity. One of the largest gifts in the history of Maine higher education, the Bonneys’ gift, given by their family foundation, will fund the building and renovation of new and modernized STEM facilities at Bates, Spencer explained, creating a “physical platform for science that matches the talent and ambition” of Bates faculty and students. For Bates, “the time is now,” said Michael Bonney, who is chair of the Board of Trustees, one of three co-chairs of The Bates Campaign, and the retired CEO of Cubist Pharmaceuticals. Driving Academic Excellence: $100 million (33 percent of goal). Through excellence in its faculty and its academic programs and facilities, Bates actively engages the forces — intellectual trends, demographic changes, and technology — that are transforming higher education and the world. The Bonneys’ $50 million gift supports this objective by providing funds to build a new science facility while modernizing existing facilities. In addition, gifts received during the campaign’s quiet phase have funded the college’s new Program in Digital and Computational Studies. Investing in Opportunity: $75 million (25 percent of goal), all to be directed to the endowment. Bates offers highly competitive financial aid that allows the college to draw talent from all corners of the United States, from around the world, and from every socioeconomic quarter. This priority includes the Financial Aid Challenge, which will match, dollar for dollar, all new pledges between $50,000 and $250,000 to financial aid endowment. Catalyzing Student Success: $65 million (22 percent of goal). Bates is distinctive for its attention to the overall experience of its students — including leadership and student programming, inclusivity, athletics, and Purposeful Work — and for giving students a strong bridge to life after college. Building Financial Sustainability: $60 million (20 percent of goal). Above and beyond funds raised for other campaign objectives, a central goal of The Bates Campaign is to increase the college’s unrestricted endowment funds ($20 million over five years) and to sustain support for the Bates Fund, which raises nearly $7 million annually to support the operating budget. The priorities of The Bates Campaign reflect the recently completed Bates College Institutional Plan. Approved by the Board of Trustees in October 2016, the plan emerged from two years of college-wide discussions that were guided and informed by the college’s founding mission; by Bates’ present strengths and weaknesses in higher education; and by the college’s ambitions. Approximately 80 faculty, staff, and students participated in the planning process, work that was complemented by outreach to the broader community of alumni, parents, and friends. 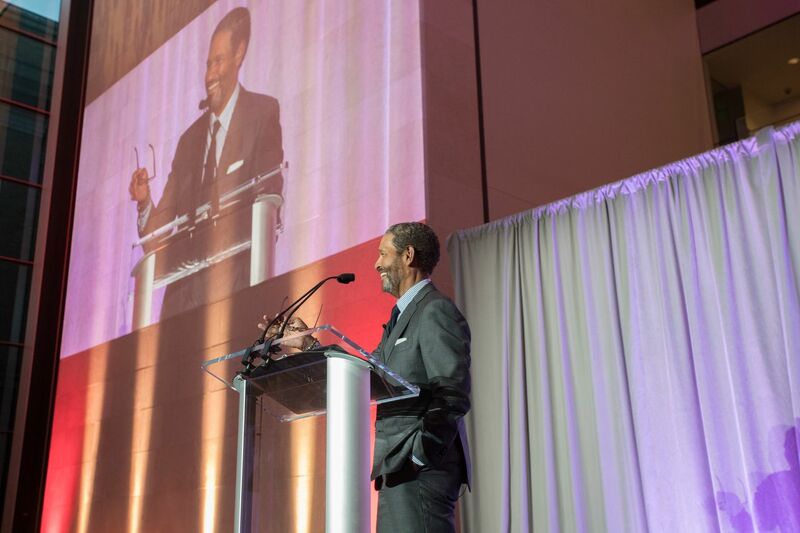 In Boston and New York, Gumbel introduced brief talks by honors theater major Dan Peeples ’17; Professor of French and Francophone Studies Kirk Read; and Professor of Psychology Amy Bradfield Douglass. Their stories were punctuated by short films celebrating the distinctive Bates experience inside and outside the classroom — from ultracold physics to the ultra-chilly Puddle Jump. Also offering personal remarks in Boston and New York were campaign co-chairs Geraldine FitzGerald ’75 and John Gillespie ’80, P’13, P’18. “We just want to amplify the Bates we all know and love,” said Spencer. Picking up where FitzGerald’s story left off, Gillespie talked about the campaign’s Financial Aid Challenge and the opportunity for Bates donors to “pay it forward and support Bates students” by tapping into the $5 million challenge fund to create permanent endowed funds for financial aid. The $168.5 million campaign total to date includes 18 gifts or pledges of $1 million and above. The Bates Campaign goes public on the heels of historic increases in giving to Bates. During the giving year ending June 30, 2016, Bates donors contributed a record $28.2 million. Giving to Bates has increased 30 percent or more in each of the last three fiscal years — more than doubling overall since fiscal 2013, the initial year of Clayton Spencer’s presidency. The $168.5 million campaign total announced to date includes 18 gifts or pledges of $1 million and above. Signature gifts to Bates during the first four years of the Spencer presidency have included the $11.5 Catalyst Fund gift to support a series of strategic initiatives, and $19 million in gifts announced in February 2016 to endow six new endowed professorships and launch the college’s Program in Digital and Computational Studies. In October 2016 Bates named its two new residence halls in honor of Elizabeth Kalperis Chu ’80 and J. Michael Chu ’80 in recognition of their $10 million gift. Bates has conducted four previous campaigns over the last half-century, all successes, including efforts concluding in 2006 ($120.9 million raised); in 1996 ($59.3 million); in 1984 ($21.4 million); and in 1974 ($6.9 million).